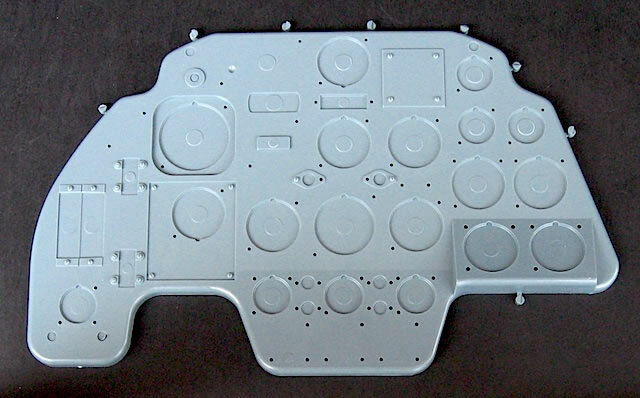 100 grey plastic parts; 28 clear plastic parts; 2 frets of pre-painted photo-etched brass; 1 decal sheet; 8 page black-and-white instruction booklet. We first saw Eduard’s 1/4 scale Bf 110 C instrument panel in 2008 as a bonus item in the Bf 110 C/D/E Royal Class boxing. 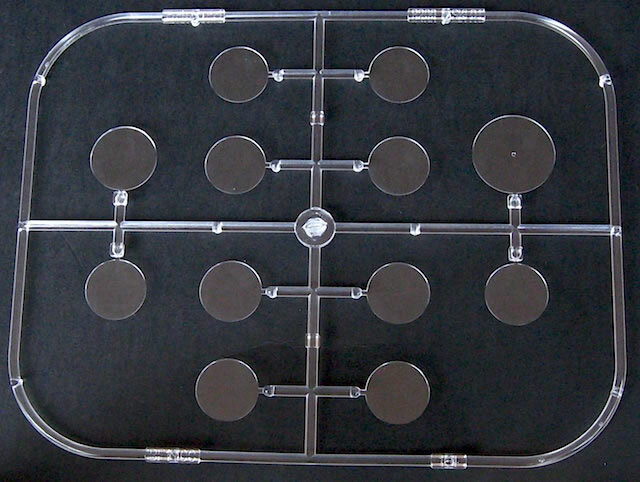 Eduard released the panel as a stand-alone kit in 2011, and Mark Davies reviewed it on Hyperscale here. Mark’s in-box review was very positive, as was Brett Green’s earlier build review on Testor’s Scale Workshop. I’ve seen the kit built up – a friend at my local model club finished it for a competition last year – and was impressed enough that I bought one for myself. 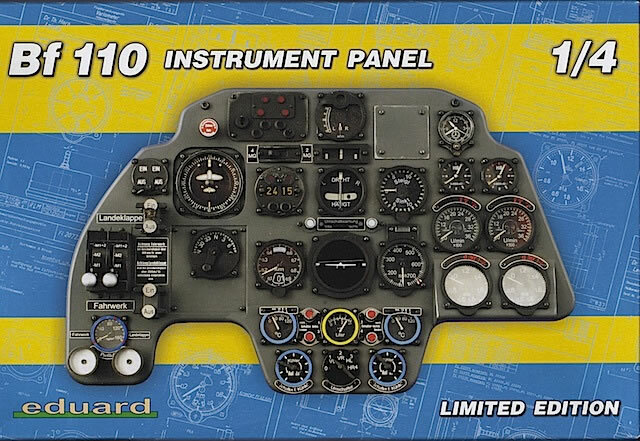 Now, hot on the heels of its 1/4 Bf 109 E instrument panel, Eduard has re-issued this popular kit with a few tweaks and improvements to the original release. The first change I noticed is to the box art. 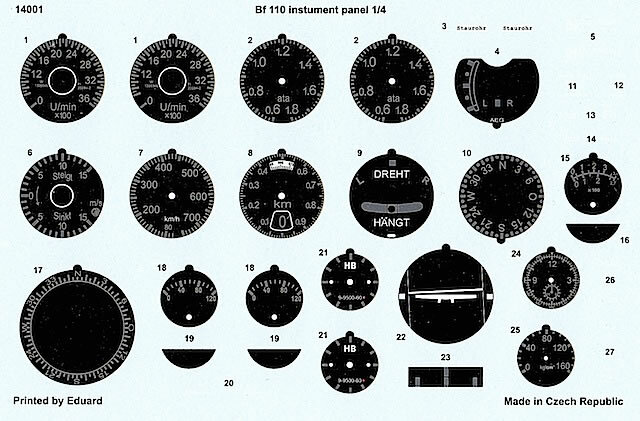 While design and layout is identical on both editions, the instrument panel on the cover of the new kit is more clearly reproduced, with some different coloured bezels and instruments. There are also differences inside. 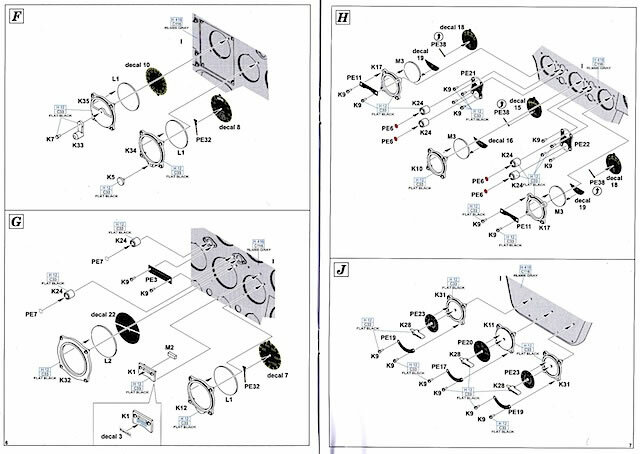 Some are cosmetic – the new plastic parts are dark grey, while the old ones are black. More substantially, the instrument faces that were originally supplied as vinyl stickers are now provided as decals. In his video review Brett pointed out that while the stickers work perfectly well, they are very sticky – which can be potentially tricky if they need to be repositioned. Decals should be easier to adjust, although I would recommend applying them to a very glossy surface to reduce the possibility of any ridges or bubbles. The other difference between the two sets of instrument faces is colour. I’ve scanned the sets side by side to show you what I mean – the stickers are on the left and the decals are on the right. You can see that the numbers and dial increments on the decals have (mostly) been reproduced in light grey, while on the stickers they are white. I haven’t got a photograph of an actual Bf 110 panel to compare them with, so can’t say which of the two is more accurate – although both will look excellent when applied. Eduard has corrected a spelling error that was present on the original turn and bank indicator, replacing ‘draht’ with ‘dreht’. And the new artificial horizon is black and white, rather than the original blue and maroon. Again, I don’t know which is more accurate, although I would like to think that the change reflects further research by Eduard. As previous reviewers have pointed out, kit assembly should not be difficult as long as you take care and don’t rush. The instructions are busy and require careful study. A useful step-by-step paint guide is provided, although it doesn’t mention the coloured bezels that are shown on the box illustration; I’d recommend checking your references. This is a great little kit in any of its incarnations. I think that the changes Eduard has made to the latest boxing are an improvement, but they don’t make earlier editions redundant. 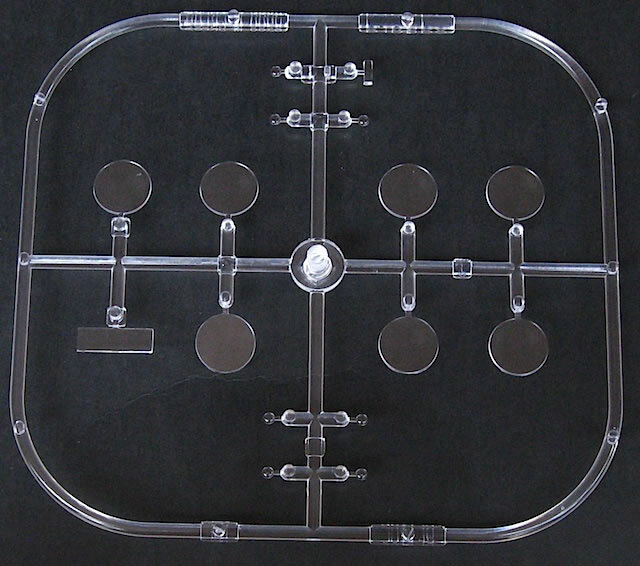 If you’ve got the older boxing, it will still build into an excellent replica; if you don’t have the kit but are thinking of buying it, I’d seek out the current release.